News that Salesforce had purchased Datorama crossed the wire just as I was starting on two weeks of travel, so I haven’t been able to comment until now. This was purchase was noteworthy as the first big CDP acquisition by a marketing cloud vendor. That the buyer was Salesforce was even more intriguing, given that they had purchased Mulesoft in March for $6.5 billion and that Marketing Cloud CEO Bob Stutz (who announced the Datorama deal) had called CDPs “a passing fad” and said Salesforce already had “all the pieces of a CDP” in an interview in June. The Salesforce announcement didn’t refer to Datorama as a CDP and Datorama itself doesn’t use the term either. They do meet the requirements – packaged software building a unified, persistent customer database that’s open to other systems – but are definitely an outlier. In particular, Datorama ingests all types of marketing-related data, notably including ad campaign- and segment-level performance information as well as customer-level detail. Their stated positioning as “one centralized platform for all your marketing data and decision making” sure sounds like a CDP, but their focus has been on marketing performance, analytics, and data visualization. Before the acquisition, they told me some of their clients ingest customer-level detail but most do not. So it would appear that while Salesforce’s acquisition reflects recognition of the need for a persistent, unified marketing database (something they didn’t get with MuleSoft), they didn’t buy Datorama as a way to build a Single Customer View. Datorama’s closest competitors are marketing analysis tools like Origami Logic and Beckon. I’ve never considered either of those CDPs because they clearly do not work with customer-level detail. Datorama competes to a lesser extent with generic business intelligence systems like Looker, Domo, Tableau, and Qlik. These traditionally have limited data integration capabilities although both Qlik and Tableau have recently purchased database building products (Podium Data and Empirical Systems, respectively), suggesting a mini-trend of its own. It’s worth noting that one of Datorama’s particular strengths is use of AI to simplify integration of new data sources. The firm’s more recent announcements have touted use of AI to find opportunities for new marketing programs. Datorama is much larger than most other CDP vendors: it ranked third (behind Tealium and IgnitionOne) in the CDP Institute’s most recent industry report, based on number of employees found in LinkedIn. The company doesn’t release revenue figures but, assuming the 360 employees currently shown on LinkedIn generate $150,000 each, it would have a run rate of $54 million. (This is a crude guess: actual figure could easily be anywhere from $30 million to $80 million.) Sticking with the $54 million figure, the $800 million purchase price is 15x revenue, which is about what such companies cost. (Mulesoft went for 22x revenue.) The company reports 3,000 clients, which again is a lot for a CDP but gives an average of under $20,000 per client. That’s very low for an enterprise CDP. It reflects the fact that most of Datorama’s clients use it to analyze aggregated marketing data, not to manage customer-level details. 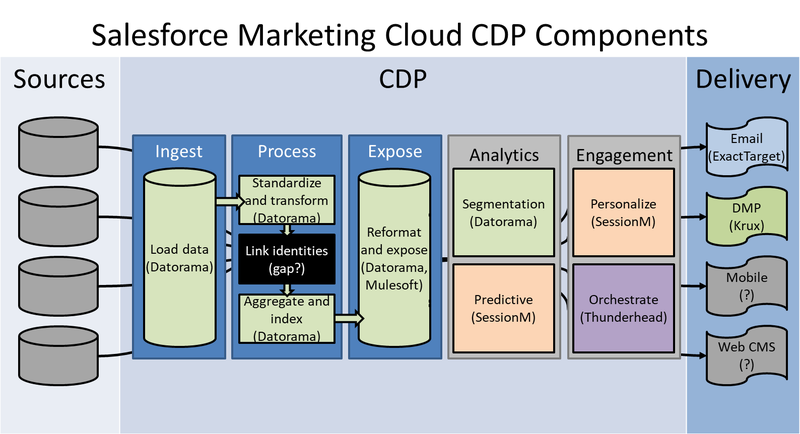 Seeing Datorama as more of an marketing analysis system than CDP makes it a little easier to understand why Salesforce continues to work with other CDP vendors. The Datorama announcement was followed a week later by news that Salesforce Ventures had led a $23.8 million investment in the SessionM CDP, which had announced an expanded Salesforce integration just one month earlier SessionM builds its own database but its main strength is real-time personalization and loyalty. Salesforce in June also introduced Marketing Cloud Interaction Studio, a licensed version of the Thunderhead journey orchestration engine. Thunderhead also builds its own database and I consider it a CDP although they avoid the term, reflecting their primary focus on journey mapping and orchestration. The Salesforce announcement states explicitly that the Interaction Studio will shuffle customers between campaigns defined in the Marketing Cloud’s own Journey Builder, clarifying what any astute observer already knew: that Journey Builder is really about campaign flows, not true journey management. So, how do all these pieces fit with each other and the rest of Salesforce Marketing Cloud? It’s possible that Salesforce will let Datorama, SessionM, and Interaction Studio independently build their own isolated databases but the disadvantages of that are obvious. It’s more likely that Salesforce will continue to argue that ExactTarget should be the central customer database, something that’s been their position so far even though every ExactTarget user I’ve ever spoken with has said it doesn’t work. The best possible outcome might be for Salesforce to use Datorama as its true CDP when a client wants one, and have it feed data into SessionM, Interaction Studio, ExactTarget, and other Marketing Cloud components as needed. We’ll see if that happens: it could evolve that way even if Salesforce doesn’t intend it at the start. Looking at this from another perspective: the combination of Datorama, SessionM, and Interaction Studio (Thunderhead) almost exactly fills every box in my standard diagram of CDP functions, which distinguishes the core data processing capabilities (ingest, process, expose) from optional analytics and engagement features. Other Marketing Cloud components provide the Delivery capabilities that sit outside of the CDP, either directly (email and DMP) or through integrations. The glaring gap is identity linkage, which Datorama didn’t do the last time I checked. But that’s actually missing in many CDPs and often provided by third party systems. Still, you shouldn’t be too surprised to see Salesforce make another acquisition to plug that hole. If you’re wondering where Mulesoft fits, it may play a role in some of the data aggregation, indexing, reformatting, and exposing steps; I’m not clear how much of that is available in Datorama. But Mulesoft also has functions outside of this structure. In short, it’s quite true that Salesforce has all the components of a CDP, especially you include Datorama in the mix. The idea of stringing these systems together raises a general point that extends beyond Salesforce. The reality is that almost every marketing system must import data into its own database, rather than connecting to a shared central data store. I’ll admit I’ve often drawn the picture as if there would be a direct connection between the CDP database and other applications. This should never have been taken literally. There are indeed some situations where the CDP data is read directly, such as real time access to data about a single customer. But even those configurations usually require the CDP data to be indexed or extracted into a secondary format: absent special technology, you don’t do that sort of query directly against the primary “big data” store used by most CDPs. Outside of those exceptions, a subset of CDP data will usually be loaded into the primary data store of the customer-facing applications (email, DMP, Web personalization, etc.). Realistically, those data stores are optimized for their own application and the applications read them directly. There’s no practical way the applications can work without them. This is a nuance that was rightly avoided in the early days of CDP as we struggled to explain the concept. But I think now that CDP is well enough understood that we can safely add some details to the picture to make it more realistic and avoid creating false expectations. I’ll try to do that in the future.